The best way to describe the 2018 Nissan Frontier is a workhouse. This truck can handle any personal or professional projects you might throw at it. This is because the truck features a fully boxed ladder frame, and even gives you two different powerful engine options. New to the 2018 model year is the RearView Monitor, which is standard across all Nissan Frontiers. Other enhancements include standard Siri Eyes Free, 5.0-inch color display audio, Bluetooth Hands-free Phone System, cruise control, and air conditioning. The biggest addition to 2018 is the Midnight Edition. This edition offers black badging, black outside rearview mirrors and door handles, body-color front and rear bumpers, semi-gloss black step rails, 18-inch gloss black aluminum-alloy wheels, and gloss-black grille. You can have this special edition in Crew Cab SV 4×4 and 4×2 automatic transmission options. 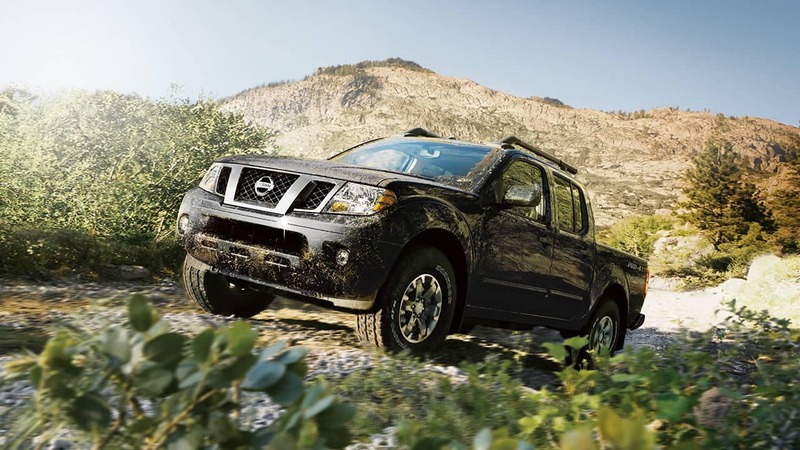 What powertrain options are offered with the Frontier? There are a few transmission and engine options available with the Frontier. The three transmissions are the five-speed automatic, the five-speed manual, and the six-speed manual. The two engine options are the 2.5-liter inline 4-cylinder that creates 152 horsepower and 171 lb-ft of torque, and the 4.0-liter DOHC V6 engine that produces 261 horsepower and 281 lb-ft of torque. The 4-cylinder engine garners 19 mpg city and 23 mpg highway. You can also find this truck in two configurations, 4×4 and 4×2. The towing capacity is up to 6,690 pounds. What safety equipment is included in the 2018 Frontier? There is a long list of safety features offered with the 2018 Frontier. These features include roof-mounted curtain side-impact supplemental air bags with rollover sensor for front and rear-seat outboard occupant head protection, front seat-mounted side-impact supplemental air bags, Nissan Advanced Air Bag System, and Zone Body construction with front and rear crumple zones. Other equipment includes a Tire Pressure Monitoring System, the LATCH child seat anchor system, 3-point front seat belts with pretensioners and load limiters, and 3-point seat belts for all rear seat occupants. What kind of design features are available? There is a wide array of models available with the 2018 Nissan Frontier. One of these many options is the Frontier SV Crew Cab which offers front reading/map lamps, bed rail caps, dual power outside mirrors, power door locks, manual sliding rear window with lock, power windows with driver’s auto down, remote keyless entry, and a 12-volt power outlet. Another option is the PRO-4X, which gives you leather-appointed white-stitched shift knob and steering wheel, dual power outside mirrors, power windows and door locks, remote keyless entry, cruise control, body-colored grille and bumpers, fog lamps, outside mirrors and door handles, a 5.8-inch display, SiriusXM Travel Link, and Nissan Voice Recognition for navigation and audio. One of the highest trim options is the Frontier Crew Cab SL, which includes illuminated vanity mirrors, tubular step rails, chrome outside door handles, chrome bumpers and outside mirrors, chrome front grille, body-color side moldings, HomeLink Universal Receiver, outside rearview mirrors, dual power heated, leather-wrapped steering wheel and shift knob, rear fold-down center armrest, 4-way power passenger seat, 8-way power driver’s seat, leather-appointed seating, and 18-inch aluminum-alloy wheels. If you are looking for a workhorse pickup truck, the 2018 Frontier is the perfect truck for you. Whether you need it for work, for fun, or just for the possibilities it presents you, there is no better option in its segment than the 2018 Nissan Frontier. Want to learn more? You can send your questions in by using the form below, or you could even schedule a test drive with us!